With its cutting-edge web-based support and interactive learning opportunities, college faculty will find this new fourth edition an exciting new approach to teaching the introductory course in special education. In addition to providing students with a wide array of enrichment resources, interactive self-assessments, activities, and case studies, each chapter is also available online in both a multimedia and an interactive version with embedded icons that allow students to access relevant resources. Designed for both traditional certification programs and alternative programs, such as on-the-job training, this new edition carries the most current information on inclusive classrooms, transition, diversity, collaboration, and much more. It’s also responsive to federal mandates such as No Child Left Behind and the new 2004 IDEA reauthorization. 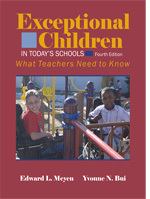 Both the book and the web-based supports have been designed to fit the staff development needs of school districts, and the web-based supports can be linked to Blackboard or WebCT. Intended for the introductory course at the graduate level, this text is really two books in one. Part One covers characteristics, while Part Two looks at alternative perspectives that challenge the existing system and the concerns of inclusion. 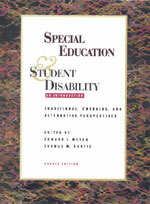 A totally separate chapter is devoted to children with severe disabilities. This is the only book that presents sociological, anthropological, and organizational perspectives.